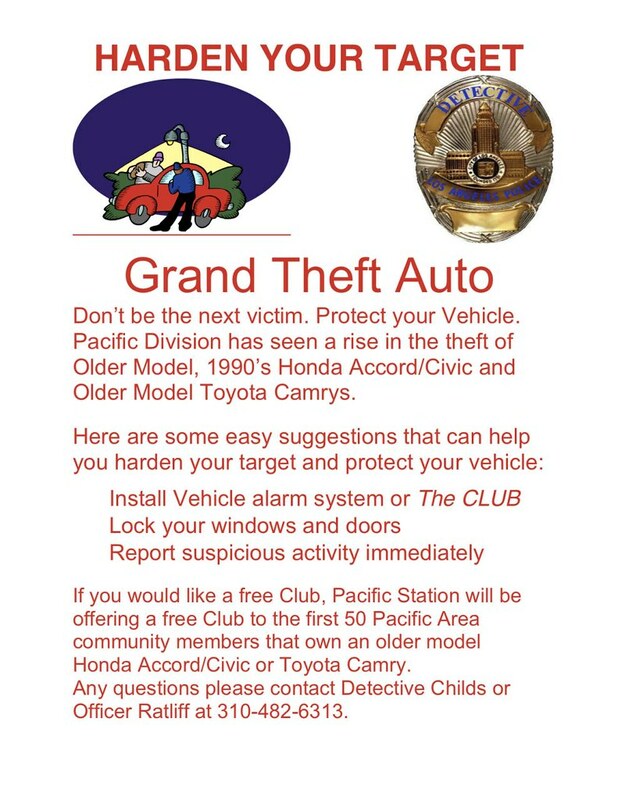 LAPD Notes Increase in Garage Burglaries + Auto Break-Ins - Yo! Venice! We need your help. We have had an increase of garage burglaries and car’s broken into in the Venice area. Most of the reports state the crime was due to a garage door left open, car’s left unlocked, with valuables inside, and windows left open. We need your help to “Harden The target”. Can you please send out an email to all the residents in your email tree reminding people to… PLEASE CLOSE GARAGE DOORS, LOCK YOUR CARS, DO NOT LEAVE VALUABLES INSIDE YOUR CARS AND LOCK THE DOORS AND WINDOWS TO YOUR HOUSE. ALSO, PLEASE DO NOT LEAVE BICYCLES OUTSIDE.